Make a puppet! Making a puppet can be as simple or as hard as you want it to be! Paper Bag Puppets: Take a paper lunch bag and where the bottom of the bag folds, create a face. The fold will be the puppet’s mouth. 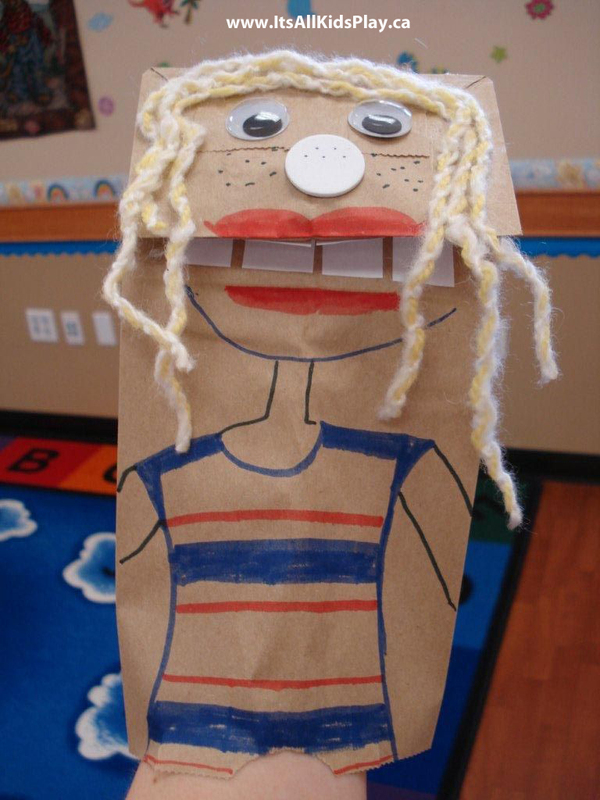 Decorate your puppet by colouring, drawing, painting or gluing things to the bag to give your puppet character as well as face. Sock Puppets: Take an old sock that you can fit your hand into. The toe of the sock will be the mouth and nose area of the puppet. Glue or sew scrap material to the sock to make a mouth, nose and eyes. Buttons make great eyes, and yarn or string makes excellent hair. Finger Puppets: Take a piece of cardboard and cut it out into the shape of a person or an animal—but without legs. Your fingers will be the puppet’s legs. To do this, cut holes in the bottom of the puppet for your fingers to fit through. Decorate your puppet. If you would like a template (something you can print off and cut out) look for ‘finger puppet templates’ online. For instructions on how to make more elaborate puppets, check out the arts and crafts section of your public library. Once you are done making your puppet, put on a puppet show! Make this a family activity: Make puppets together and put on a little show. This activity promotes creativity and storytelling skills.